Propane, also known as Liquefied Petroleum Gas, or LP, is a different fuel source than most typical fuels. Diesel fuel and gasoline are liquid fuels while Natural Gas is a gas vapor fuel. LP is a blend of both and has a few unique peculiarities to it. First, LP can be used in either liquid or gas vapor form. Anything in your RV uses gas vapors to run and most portable devices, such as heaters utilize gas vapor. However, liquid withdrawal is used in most engines, such as forklifts because it can be better controlled in their carburetion systems. Yet, both liquid and gas can both be obtained from the same propane tank. To understand how this works let’s take a better look at what propane is. Propane is technically a liquid. That’s why it’s called LP. However, like any liquid, it has a boiling point. If you fill a bucket with water it just sits there. But, once you put a fire under the water and raise it’s temperature to 212° F, it begins to boil and water vapor escapes (steam). Eventually the water is all evaporated and the bucket gets empty. However, if you place water into a radiator and install a pressure cap, the boiling point of water is raised as the pressure increases. This is also the principle behind geysers, which build up huge amounts of pressure to hold back super-heated water until it just can’t no more, and then it blows. Propane too, has a boiling point. It’s -44° F. So, if you had a bucket of propane and it was 50 or 60 below outside, technically it would not evaporate. But the minute it goes above that temperature, it wil boil and the gas will evaporate and you’ll eventually wind up with an empty bucket. However, when we pump the propane into an enclosed cylinder, there won’t be any place for it to evaporate. But, we do want to get some of the evaporated gas to run our propane appliances and there is a way to do this. By filling a propane cylinder to no more than 80%, there will be an open area above the surface of the liquid propane where the evaporating gasses can accumulate. Just a little bit of liquid propane will expand into a very large amount of propane gas and that’s the stuff we want to get. A propane tank that is filled to 80% will have an output port with a shutoff valve that accesses the very top of the tank, where the gas is. If you have a portable tank and were to turn it upside down or lay it on it’s side you would be pumping raw liquid propane through and your grill would probably have flames shooting out of it 6′ high so you always need to use portable tanks in their upright position. On a motorhome, the tanks are mounted horizontally but the pickup tube still goes to the top of the tank. If a propane tank were to be filled beyond 80% you would have a serious fire hazard as the liquid propane was run through the system. For that reason, it’s important to watch the bleeder valve when filling a motorhome’s propane tank. Once the liquid starts to come out it’s time to stop refueling. Propane has less BTU per gallon than gasoline or diesel fuel so it will require more gallons to do the same amount of work. But propane has a number of benefits over liquid fuels that work well in certain applications. For one thing, propane is stored in a sealed vessel. You don’t have to worry about dirty fuel, water in the fuel, or any kind of algae growth. At the initial tank fill, the LP tank is purged with methanol to remove any water vapors that may be in prior to filling. Because it is a light gas it also is very clean burning. Could you imagine how tasty your food would be if your cook top or outdoor grill ran off diesel fuel? When running engines, including generator sets, propane will be a more costly proposition due to it’s lack of energy related to other fuels. However, it is typically used in indoor applications such as forklifts were the fumes of a gasoline or diesel engine are not acceptable. Propane does have a disadvantage in that it’s low boiling point doesn’t allow it to run very well in cold weather. If you try to draw too much propane out of too small of a cylinder, it won’t be able to keep up in the gas production area. Your gas pressure will drop and your appliances will not burn very well. Following is some more info on LP gas. Of particular interest to winter (cold weather) campers are the charts below regarding the available BTU’s from a container of LP gas in an hour. Total the possible BTU’s from your gas appliances and compare to the gas available. It may explain the mysterious winter time heating problems. This is also why your LP fueled generators don’t work very well in cold weather. LP gas systems should be checked yearly (at the very least) for leaks and the correct operating pressure. Checking the pressure requires a manometer which most owners don’t keep in their tool boxes and so should be done by a dealer or service center. LP gas systems are designed to operate at 11″ WC (water column) or about 6 1/4 oz. per sq. in., at this low pressure it doesn’t take much of a change up or down to affect how your appliances operate. You may want to check the manufacture date of your LP cylinders, even the ones you have at home on your BBQ grill. If they go out of date while you are traveling you may not be able to have them filled. The date is stamped on to the collar of ALL LP cylinders in the form MM – YY. When a cylinder reaches its 12th birthday it must be inspected or recertified. If you find more than one date the most current should have a letter after it, most often an E, this date is good for 5 years. Effective October 1, 1998, all cylinders with capacities from 4 #’s to 40 #’s must have an OPD (Overfill Protection Device) valve installed or it can not be refilled. There are few things more enjoyable than firing up a few burgers and brats on the backyard grill. This time of year, I’m out back grilling almost every night. And while the battle over gas or charcoal may never officially be settled, I’m here to lend my support to the power of propane. Here are ten of the reasons I choose gas over charcoal. While it’s true that gas is a fossil fuel and charcoal is a renewable resource, the burning of charcoal produces a much larger carbon footprint than gas. A 2003 study from the Oak Ridge National Laboratory said using a gas grill for an hour emits about 5.6 pounds of carbon dioxide, whereas a charcoal grill produces 11 pounds. In theory, you could reduce the charcoal footprint by using pure lump charcoal instead of common briquettes, but acquiring those coals may require shipping, thus offsetting any reduction in carbon footprint. If you want to cook your food at a specific temperature, you’ll have an easier time using gas. Charcoal is less predictable, and it’s hard to adjust the temperature to accommodate different kinds of food. (Steaks may like a super-hot grill, while veggies might cook best with a medium heat, for example.) Stick with gas, and you’ll spend less time fiddling with your grill and more time enjoying your adult beverage. Briquette supporters will rightly point out that charcoal grills can get considerably hotter than gas grills. But how hot do you really need your grill to get? My gas grill easily gets above 500 degrees, which is hot enough for anything I cook. Remember: you’re cooking steaks, not firing pottery. It can take up to 20 minutes for a charcoal grill to get hot, while gas grills can usually get up to 400 degrees in no time. That’s good for when it’s weeknight, you just got off work, and the kids are clamoring for their dinner. Quicker food means a happier family. Charcoal supporters will argue that you can produce wider range of flavors using coals over gas. But really, this is nonsense; coals do not impart any flavor. You might get a better char on your meat from charcoal, but I’ve had great success creating good char on my food just by cranking the heat and experimenting with various direct and indirect cooking techniques. Smoker boxes placed on a gas grill allow you to infuse your food with flavor from wood or coal shavings. You’d be surprised with what you can accomplish. I can refill my propane tank at a local general store for less than $20, and it lasts me most of the summer. You can only get two bags of charcoal for that price, and you’ll still need to buy lighter fluid. The lower cost of the fuel more than offsets the higher price of gas grills if you do a decent amount of grilling. I’ve come home and fired up burgers on my gas grill while still wearing a shirt and tie. Try doing that with charcoal. Overall, gas grills don’t require as much cleanup after cooking due to the lack of leftover ash, and there are no black coals to handle. As long as you have a full propane tank, you can cook for hours on a gas grill. It’s perfect for when you have 50 people over for a Father’s Day picnic. With charcoal, you’ll have to change the coals out after a certain point as the heat dies down. It’s very hard — and perhaps unsafe — to cook on a charcoal grill when it’s very windy. And charcoal grilling in the rain is a challenge. But I’ve used my gas grill in all kinds of weather (including snow!) The gas stream allows flames to remain consistent and are generally unbothered by outside elements. The U.S. Consumer Product Safety Commission reported that between 2005 and 2009, charcoal grills led to an average of eight deaths annuallyfrom carbon monoxide poisoning. Gas grills, meanwhile, caused fewer than one death per year. 1) What gas grill regulator do I need to power my grill? a. This all depends on how big of grill you have. We recommend any BBQ grill that has an output rating of 60K BTU’s or less use our 90? regulator and hose assembly (see p/n 106044). Any BBQ grill that has a BTU output in the 60K to 99K BTU range we recommend our single stage, 180″ BBQ grill regulator and hose assembly (see p/n 106195). And for any BBQ grill with the BTU output at 100K or above should go with a two stage regulator and hose assembly (see p/n 106238). 2) What is a BTU? a. A BTU, short for British Thermal Unit, is a basic measure of thermal (heat) energy. One BTU is the amount of energy needed to heat one pound of water one degree Fahrenheit, measured at its heaviest point. In other words, if you placed 16 ounces of water at 59F into a stovetop pan and turned on the gas burner, it would take one BTU to raise the temperature of the water to 60F. As more BTU’s continue to flow from the gas flame, the water will eventually reach the boiling point of 212F. Since BBQ Grills output are rated by BTU’s, the components that make up the BBQ grill including the BBQ Grill Regulator, Burners, Quick Connects, etc are also all rated by BTU to ensure the BBQ Grill gets the optimal equipment in order to work the grill at its maximum capacity. 3) Do I need a 90″, 180″ or two stage propane regulator for my gas BBQ grill? a. As noted earlier, this will be based off of the amount of BTU?s required by the grill. In terms of our offering, we purposely have the three different regulators to make it easy to determine which one is best for each BBQ Grill BTU output rating. 4) Why do some BBQ grill regulators have a black knob and some have a green knob? a. As the regulators are made for varying BTU requirements, so are the tank connection Type 1 knobs. The Black knob will allow up to 100K BTUs of flow and the green know will allow up to 200k BTU’s of gas flow. In an effort to ensure the Type 1 tank connection never goes into by-pass mode, we include a green knob on any BBQ Grill Regulator we sell over 60K BTU’s. 5) How do I take my old regulator off my gas grill? a. This process is much simpler than you would expect. The vast majority of BBQ Grill regulator hose assemblies terminate at the grill with a 3/8″ F Flare swivel. Follow the hose of the regulator assembly to where it connects to the inlet of the burner. Using a 3/4″ wrench, unscrew the old propane BBQ grill regulator from the inlet and then screw on the new regulator. Ensure you tighten to at least 18 foot pounds. 6) Can I buy a gas grill regulator that is protected from squirrels eating the hose? a. We offer all of our regulators with the option of adding stainless steel overbraid that protects the hose and keeps small animals or varmints from eating through the hose creating a gas leak. 7) My propane cylinder has a quick disconnect female. Can I purchase a BBQ grill regulator with a male quick disconnect plug to fit my tank valve? a. Yes, we offer our 90? regulator with a 5LPN male quick disconnect. See part number 106076. If you need a male quick disconnect plug on a 180? or two-stage propane regulator, please contact us at (314) 598-5067. 8) Can I use a high-pressure regulator on my gas grill to get it hotter? a. Absolutely not. If a BBQ grill comes with a low pressure regulator, you MUST use a low pressure regulator dialed in at 11″ W.C. pressure. Greener Grilling: Gas or Charcoal? What’s the greenest way to grill? Earth911 decided to investigate. When it comes to carbon footprint, propane and natural gas grills beat out charcoal as the most eco-friendly. Scientists in the United Kingdom conducted an Environmental Impact Assessment Review of the two types of grills in 2009 and found that a charcoal grill emitted 2,200 pounds of carbon dioxide over its lifetime – three times the carbon footprint of a natural gas grill, which is responsible for 769 pounds of carbon dioxide. The study reported that the dramatic difference in carbon emissions was due to gas’s more efficient production and cooking. The process of converting wood and biomass into charcoal in a kiln is very energy intensive, according to Paul McRandle, Smarter Living editor for the Natural Resources Defense Council. Grilling with charcoal also produces more air pollutants than gas grills do. Gas grilling isn’t completely clean-burning, but charcoal releases higher levels of carbon monoxide and volatile organic compounds (VOCs) that contribute to the formation of smog – which harms not just the environment, but also human health. Starting the charcoal barbecue can also contribute to poor air quality: Lighter fluid and self-lighting charcoals contain chemicals that emit VOCs. As for disposal, propane and natural gas come out on top again. Empty propane tanks can be traded in or refilled, and gas barbeques hook up directly to your house’s natural gas supply, so there is no waste to dispose of. While some expert gardeners say they use chemical-free charcoal as mulch in their garden, the best disposal option for most charcoal, which is treated with chemicals, is, unfortunately, the garbage can. But many people aren’t ready to give up that special, smoky flavor that charcoal grilling imparts. To make your charcoal grilling a little kinder to the planet, trade in your lighter fluid and self-lighting briquettes for a newspaper-burning chimney starter, McRandle advises. Which type of charcoal is easier on the environment: lump charcoal or charcoal briquettes? Because lump charcoal comes from trees, it can contribute to deforestation if the forests aren’t managed properly. Charcoal briquettes are made from waste wood – an environmental plus – but are treated with chemicals that can harm the environment and your health. This is a very interseting aritcle about the history of the Weber-Stephen Products Company. George Stephen was a true American visionary. 1951: George Stephen invents the kettle grill. 1958: Weber-Stephen Products is established. 1989: Weber Grill Restaurant opens. 1993: George Stephen dies at the age of 71. 1995: Gas grill sales surpass charcoal grill sales. Family-owned Weber-Stephen Products Co. manufactures the Weber grill, a brand name that over the years has become all but synonymous with outdoor barbecue grilling. A sales leader in charcoal grills since the company’s inception in the 1950s, Weber-Stephen has in more recent years developed a line of gas grills, a market in which the company was late in pursuing. Based in the Chicago area, Weber-Stephen is not only privately held, it is extremely private in general, taking on the personality of publicity-shy George Stephen, who invented the Weber Kettle Grill and ran the company for more than 30 years. Eleven out of his 12 children have been employed by Weber-Stephen. All decline to be interviewed by the press. Outdoor cooking dates back to the discovery of fire, and many cultures have traditions of great feasts in which wild game was roasted over or under hot coals. Supposedly, grilling came to America by way of the Caribbean island of Hispaniola, where in the 17th century shipwrecked sailors and assorted rogues adapted the native method of cooking over hot coals by suspending meat on a grid of green wood, which the Spanish called a barbacoa. They took this method to Mexico and the American Southwest. On the range, cattle ranchers created a metal barbacoa to cook meat in order to feed their ranchhands. The new barbecued meats and outdoor method of cooking became the perfect magnet for social gatherings, drawing crowds for fairs as well as political rallies. Many houses in the early 1900s featured brick or stone fireplaces in the backyard where outdoor cooking was done. In cases where people were required to burn their own trash, backyard incinerators were modified to accommodate grilling. Many people fashioned barbecue grills and smokers out of wine barrels, oil drums, trash cans, water heater tanks, and metal roofing. Rather than using hot coals, these grills relied on wood and kindling. An unlikely man would develop a more convenient fuel that would greatly increase the popularity of backyard barbecuing. His name was Henry Ford. Ford, who never cared for waste or passed up a chance to make more money, owned a saw mill that provided the wooden frames for his Model T automobiles. To make use of leftovers he decided to burn wood scrap and sawdust in order to form charcoal, which was then ground into powder, mixed with a starch binder, and compressed into briquettes. The Ford Charcoal Company was located in the Michigan town of Kingsford, which would eventually bear the name of the charcoal business. Ford’s method of marketing his briquettes was anything but subtle. With every railcar of automobiles, his dealers also received a railcar of Ford charcoal to sell. At first the briquettes were sold as heating fuel but soon they were discovered to be perfectly suited for outdoor barbecuing. Not only were they easier to use than wood, they provided an evenly distributed source of heat. Makeshift grills were still the order of the day, but following World War II, when many veterans took advantage of the G.I. Bill to purchase vast numbers of suburban homes complete with backyards and patios, barbecuing became even more widespread and the first manufactured home grills began to appear. Most were of the brazier category: shallow, uncovered grills that tended to burn too hot and, cooking so close to the coals, were prone to flare-ups. Nevertheless, suburbia embraced the backyard grill, whether it be a permanent stone structure, a converted wine barrel, or a cheap tin brazier. Most grills were tended by men, who in the postwar era began to wield the tongs in the family–at least outdoors. One of those weekend chefs was 30-year-old George Stephen, who in 1951 lived in the Chicago suburb of Mount Prospect. He did his barbecuing over an old brick grill. In one of his rare interviews, he told the New York Times that ‘I was smoking up the neighborhood and burning up half of what I cooked. What was worse, I had to spend all my time away from the bar, standing there with a squirt gun to put out the fire when the grease hit the hot coals.’ Wind and rain also added to the problems of cooking on an open grill. Stephen was part owner of Weber Brothers Metal Works, a Chicago custom order sheet metal shop that produced, among other products, half-spheres that were welded together to make buoys for Lake Michigan. Rather than just dream about the perfect outdoor grill, Stephen decided to create it, utilizing the metal shop at his disposal. Stephen designed a barbecue grill that featured a ventilated lid to control the smoking and flaming. Using two halves of a buoy, Stephen’s prototype stood thigh high with a round fire pan and a matching lid with four closable vents. It worked so well that many of his friends wanted one too. The next year he decided to build 50 of the grills and see if he could sell them. ‘George’s Barbecue Kettle,’ as the refined product was first called, was priced around $50 at a time when braziers cost just $7, yet it sold so well that by 1958 Stephen bought out Weber Brothers and dropped all other metal working projects in favor of building nothing but his outdoor grill. He renamed the shop Weber-Stephen Products, retaining part of the original name in case he had to return to doing other sheet metal work. In 1959 Weber-Stephen employed 12 men who turned out 15,000 units. Stephen hired Ed Schaper, a printing salesman, to help sell the kettle grill. Both men not only forged relationships with wholesalers, they visited area supermarkets and shopping centers to show consumers how to cook on the new kettle grill, which unlike open braziers had the ability to circulate heat by an adjustment of the vents. One of their early big breaks came during a Wisconsin bratwurst festival when, because of a sudden rain storm, all of their competitors had to shut down. The kettle grill, protected from the elements by its lid, had the field to itself. Sales grew steadily, generally between 15 and 30 percent, so that by the late 1960s the Weber grill was a fixture in the Midwest, particularly Chicago and Milwaukee. On either coast, however, Weber grill sales trailed such competing brands as Big Boy and Charbroil. When inexpensive foreign products, including Hibachi grills, entered the U.S. market in the 1970s, many domestic grill manufacturers responded by turning to thinner metal and lightweight designs in order to compete on price. Weber-Stephen took an opposite approach, opting for more solid construction and targeting the high-end market. With many Americans becoming interested in more sophisticated fare than just hamburgers and an occasional chicken breast, the Weber grill became the product of choice for the more upscale market. Clearly well designed and made to last, Weber grills could easily command a premium pricepoint. Weber-Stephen had by this time developed a roster of freelance representatives to sell their grills in the United States and Canada and, to a lesser degree, overseas. Sales increased by 40 percent a year in the mid-1970s. Although the company did not announce its financial results, it was estimated that by the late-1970s Weber-Stephen was shipping between 500,000 and 800,000 units a year, generating gross sales between $15 million and $24 million. The product was so entrenched by now that ‘the Weber’ became almost a generic term for barbecue grill. Stephen continued to run the company, bringing his children into the operation, with 11 out of 12 working for Weber-Stephen at some point. As more and more households purchased grills, the market began to mature and the rapid growth in Weber sales tailed off. In the late 1970s and into the 1980s, Weber-Stephen would make attempts at diversification, turning to such products as lanterns, bird feeders, mailboxes, tablecloths, sail covers, and electronic bug zappers. After suffering poor results in these ventures, the company decided to focus on making its grills even better. They also moved aggressively to protect their kettle design. In 1983, some two dozen foreign competitors exhibited grills that looked like Webers at the National Hardware show, prompting Weber-Stephen to pursue a five-year legal battle to gain trademark status on its kettle design. Aside from foreign companies, Weber-Stephen faced an additional challenge from the makers of gas grills, which had been around since 1960 when the units were tied to natural gas lines and anchored in place. In the early 1970s propane tanks were introduced, making gas grills portable. George Stephen recognized the potential of gas and as early as 1972 made an attempt to incorporate it into his line of grills, but in the end he decided instead to focus on charcoal grills. By the mid-1980s, however, gas grills were beginning to make significant gains, despite a price that was much higher than charcoal grills. Many consumers were simply won over by the speed and convenience of gas. Weber-Stephen, well behind in gas grill development to such heavyweight competitors as Sunbeam Products, invested the money and resources necessary to develop gas grills, premiering its Genesis line in 1985. In that year, charcoal grills still outsold gas grills by a wide margin, accounting for 70 of the more than 11 million total units sold, but the momentum was clearly with the gas segment of the market. The sale of charcoal grills peaked in 1988, then began to slide, while the sale of gas grills continued to rise, finally surpassing charcoal in 1995. Weber-Stephen made another attempt to broaden its business in 1989 by opening The Weber Grill Restaurant in Wheeling, Illinois. With its kitchen using six oversized Weber grills that customers could watch in action through a large window, the restaurant not only offered food that typical outdoor chefs might prepare, it demonstrated the versatility of the Weber grill by featuring such dishes as veal-stuffed pork chops or trout grilled with a bread crumb crust. The Wheeling restaurant was clearly testing the waters for a possible franchising concept, but mixed reviews dampened the enthusiasm for rapid growth. Weber-Stephen maintained that the restaurant was a success and that it would consider opening new outlets if the right situation arose, and in fact the Weber Grill Restaurant was still open a dozen years later, although no new restaurants had been added. Although Stephen would remain president and CEO, in the early 1980s he began a transition of power by forming an executive committee, comprised of his heirs and longtime company executives, that would one day run the company. He then spent a good deal of time traveling to such places as Africa and Antarctica. He concentrated on the manufacturing side of the business, leaving marketing to others. Stephen died in 1993 at the age of 71; his son James, the third oldest child, assumed the position of president and CEO. Like his father, James Stephen refused to speak with the press, and the company’s financial results were closely guarded. Not having to answer to shareholders on a quarterly basis was an advantage that Weber-Stephen continued to hold over its competitors. The company was able to invest in research and development and not have to show immediate results. No matter how profitable Weber-Stephen may have been when its founder died, some observers questioned how well positioned the company was for the long run. Weber-Stephen continued to steadily sell its high-end charcoal grills in the 1990s, even after sales of gas grills overtook charcoal. By the end of the century barbecuing was more popular than ever. According to the Barbecue Industry Association, about 75 percent of all U.S. households owned a barbecue grill in 1999, and 40 percent owned more than one. Many owned both a gas and a charcoal grill. Almost 60 percent of grills were used year-round, with men far more likely than women to do the barbecuing. Many consumers buying Weber grills were upgrading to a better-made unit that would not rust out in a season or two. Gas grills, in the meantime, were becoming even more expensive, with new models being introduced each year in a manner similar to luxury cars. With the U.S. economy booming in the late 1990s, deluxe barbecue grills became almost a status purchase. Some of these ‘outdoor cooking systems,’ which featured a massive gas grill cooking surface, side burners, and a refrigerator, approached $10,000 in price. Weber-Stephen, with its reputation for quality and accepted higher pricepoint, was well situated to take advantage of consumers’ desire for more expensive gas grills. The company staked its territory below the deluxe market but well above the average-priced grill. While Sunbeam focused on the $150-$200 market, Weber-Stephen’s low-end gas grill cost $360 and was never sale priced. In 1997 the top-end Weber gas grill cost $1,000. A year later the company introduced the Summit model costing $3,000, which it launched with a splashy advertising campaign in major magazines. Entering a new century, Weber-Stephen appeared to have made a successful transition between generations of the Stephen family. Charcoal grills maintained a loyal following, gas grills were highly profitable, and the Weber name continued to be a valuable asset, which along with its grill designs the company was active in protecting. Weber-Stephen sued a Chicago hardware store that had taken the Internet address www.webergrills .com in order to sell Weber grills. When it was clear that it would lose, Weber-Stephen withdrew the suit. The company also sued Sunbeam in 1998 over patent infringement involving the use of a sear grid on gas grills. Weber-Stephen looked to further expand its distribution channels beyond hardware stores to department stores and other high-end retailers. It also looked to the Internet to sell its high-cost, low volume grills. Discount stores, such as Wal-Mart and Kmart, where most consumers bought grills, was one market that the company needed to shore up. Foreign sales offered potential as well, but presented several ongoing challenges. With little trademark protection in many countries, Weber had to compete with cheaper knock-offs of its designs. Shipping costs of its heavy units also put the Weber grill at a price disadvantage. But perhaps one of the greatest obstacles to increased overseas sales was simply a cultural one: convincing men that there was no shame in doing the cooking. Principal Subsidiaries: Weber Grill Restaurant. Principal Competitors: Sunbeam Products; Martin Industries; Salton, Inc.
1. Shape the ground chicken into four equal-sized patties, each about 3/4 inch thick. With your thumb or the back of a spoon, make a shallow indentation about 1 inch wide in the center of each patty so the centers are about 1/2 inch thick. This will help the patties cook evenly and prevent them from puffing on the grill. Cover the patties with plastic wrap and refrigerate until you are ready to grill them, or for at least 5 minutes. 2. In a small bowl mix the mayonnaise and mustard. 3. Prepare the grill for direct cooking over medium heat (350° to 450°F). 4. Lightly coat the onion slices on both sides with oil and season with salt and pepper. Brush the cooking grates clean. Grill over direct medium heat, with the lid closed as much as possible, until tender, 6 to 8 minutes, turning once. Remove from the grill. 5. Lightly brush the patties on both sides with oil and season evenly with salt and pepper. Grill over direct medium heat, with the lid closed as much as possible, until fully cooked but still juicy, 12 to 14 minutes, turning once. During the last 2 to 3 minutes of grilling time, place a slice of cheese on top of each patty. Transfer the patties to a platter. 6. Brush the bread on one side with some oil and toast the slices over direct medium heat until browned on both sides, 1 to 2 minutes, turning once. 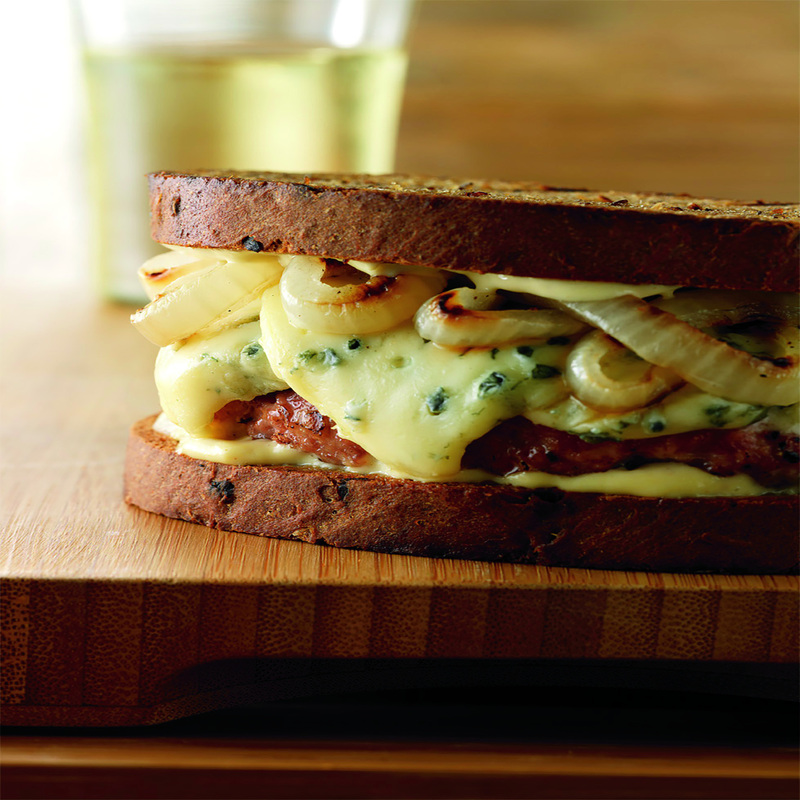 Serve the burgers on rye with the mayonnaise mixture and some onions on top.